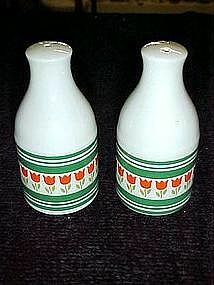 Glazed porcelain shakers are bright and festive. Green bands with a row of red/orange tulips, on a bright white background. Measures 3 1/2" tall. Milk bottle shape.Excellent condition, plastic stoppers.